Challenges are already rolling in to the Trump administration’s Tuesday ban on bump stocks, a firearm accessory that emulates automatic fire in semiautomatic weapons. While the sale and possession of fully automatic firearms has long been tightly regulated, bump stocks have long served as an alternative to permits and background checks. The variety of device, used in last year’s Las Vegas shooting, harnesses an individual firearm’s recoil to ‘bump’ its trigger faster. Now, the Department of Justice is expected to publish a new bump stock ban in the federal register. Once the ban is formally published, owners will have 90 days to turn in or destroy their bump stocks before being subjected to penalty. The announcement served as a quick trigger for Second Amendment advocates. GlobeNewswire.com reports that three firearms advocacy organizations filed a federal lawsuit against the Trump administration on Tuesday. In an interesting clash between the White House and conservative interests, attorneys accused Trump of abusing his office to forward an anti-firearm agenda. 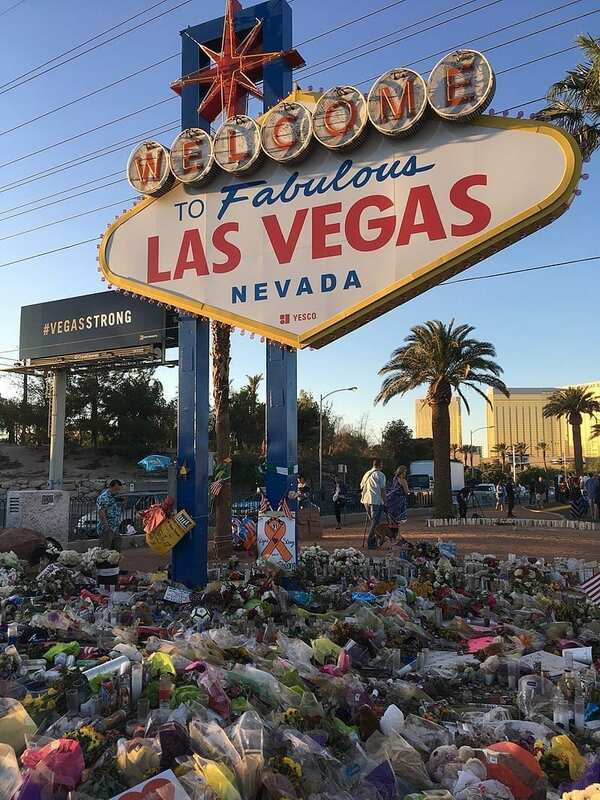 Flowers and memorials to the victims of the October 2017 shooting, considered the deadliest in modern American history. Image via Rmvisuals/Wikimedia Commons. (CCA-BY-4.0). And the National Rifle Association—which itself had advocated for a review on bump stocks’ legality after the Vegas killings—said it was “disappointed” by the administration’s decision. CNN writes that, in the past, officials at the Bureau of Alcohol, Tobacco, Firearms and Explosives (ATF) had previously concluded that bump stocks are ‘merely’ gun accessories, not a firearm part and therefore not subject to federal regulation. But Trump took a surprisingly proactive role after the Las Vegas massacre, calling on the Justice Department and lawmakers to take action and outlaw the devices. Suit filings published by GlobeNewswire take specific issue with the department’s apparent move to reclassify bump stocks as ‘machinegun’-like mechanisms. The proposal was approved by Acting Attorney General Matthew Whitaker on Tuesday.